We’re here to help make giving and receiving as easy as possible. You can find frequently asked questions below. Do I need to schedule an appointment to drop off goods? Nope! You can drop off your goods, for free, at both our Portland and Tualatin locations. We’re open for donations seven days per week, Monday – Friday, 10am – 4pm and Saturday – Sunday, 10:30am – 4pm. What is the fastest way to request a pickup? Our online request form is the quickest way to request a pick-up; if you do not have internet access, you can call us. Can you go up or down stairs when you pickup? A few porch steps are fine, but we are unable to go up internal or external flights of stairs. If you live in an apartment with an accessible elevator, that works for us, we just ask that you ensure the elevator and/or loading dock are available at time of pickup. Why do you have a $40 pickup fee? Our pickup fee helps us keep our staff healthy and our trucks up and running. Your contribution helps free up critical funds so we can serve more neighbors in need. I’d like to pay the $40 pickup fee in advance by credit card – is that possible? We can email you a square link once our drivers approve/accept your items. We do not have donors pre-pay, just in case the pickup needs to be rescheduled, canceled or in the rare event that we are unable to accept your items (if they do not meet our donation requirements). 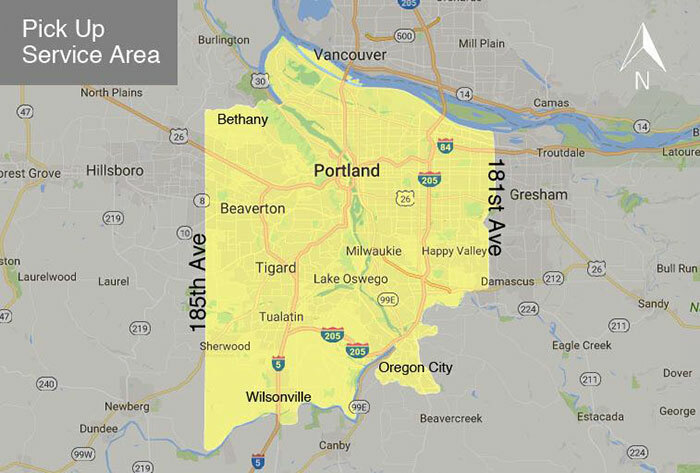 Can you pick up anywhere in the greater Portland metro area? Please view our pick-up service map (note: we are unable to pickup in Vancouver at this time). I scheduled a pickup, and the drivers would not accept my items – why? What now? Our drivers are experts in what we do, and they always have the best interests of the families we serve in mind. Please make sure you thoroughly check our What We Accept list ahead of time to make sure we can take your items. If you’re not sure, please email us! Why do I have a hard time getting ahold of someone on the phone? Our phone staff perform multiple jobs within Community Warehouse, and they deal with a high volume of calls, so they can’t always make it to the phone. They are working hard (we promise!) and will do their best to get back to you as quickly as possible. If you don’t accept my items, can you refer me elsewhere? We do our best to connect you with an alternative donation resource, check out our community resources list for options including metro recycling. My donation is really valuable, do you give a donation receipt for taxes? Yes, we have a standard donation receipt, or we can issue you a contemporaneous letter for donations over $500. We are not experts in accounting and do not have appraisal services, so the value of each item is up to you, as the donor, to verify for taxes. We recommend consulting with your CPA/accountant regarding any IRS related questions. I have antiques/collectibles that I would like to donate – do you have a good use for them? We’re glad you asked! Your items might be a great fit for the Estate Store – our fundraising enterprise that raises critical funds for our furniture bank mission. We’re always looking for quality furniture, unique and high end collectibles, antiques and jewelry. Please visit our Estate Store page to learn more. I misplaced my donation receipt. Can you send me a new one? If you scheduled a pickup or made a monetary donation, we can reissue your donation receipt. If you dropped off your items, we’re sorry, but we will not able to provide a new receipt (we do not track drop-off donations to that detail). What happens to my donated furniture? Your furnishings help create a home for someone else in need in your community. As a local, nonprofit furniture bank, we collect and redistribute furnishings and household goods to over 7,000 neighbors in need each year. Through partnerships with over 200+ different social service agencies, families and individuals visit the Warehouse to get the essential furnishings they need to create comfortable, safe, and happy homes. How do I schedule deliveries for my clients? If delivery is needed, please do not use the online scheduler. Instead, please complete and submit this form so we can schedule the delivery and appointment times together. My agency has been through your orientation, how do I go about using your services? Each individual Case Manager must attend an orientation to ensure your clients have the best possible experience at Community Warehouse. Upcoming orientation dates can be found here. You can pay online or by cash, check or money order at time service. Please click here and scroll to STEP 3 for online payment options. How long can you hold my client’s items? Can we pick them up tomorrow? We ask that you please arrange transportation for your client’s goods immediately following their appointment. If special circumstances arise, we can hold items until 4pm the same day of their appointment. What happens if my client finds all but one item, for example there is a mattress and frame, but no box spring - can we come back to get one item? Unfortunately, we are not always able to provide all furnishings that your client needs. We do our best to provide as much as possible in the hour appointment window. If you as the Case Manager feel it best to have the family come for another visit, you have the option to schedule a new appointment, however this would require another $80 access fee. What if my client doesn’t “like” anything available, can we reschedule? It is up to you and your client to decide if a reschedule makes sense. If you decide to reschedule the appointment and your client does not receive any furnishings, you will not be charged the $80 access fee.